In December 2010 I became the first dedicated Study Room Supervisor at the Smart Museum of Art at the University of Chicago. The study room is a space located just off the main galleries where artworks are selected from storage and displayed without glass or vitrines. 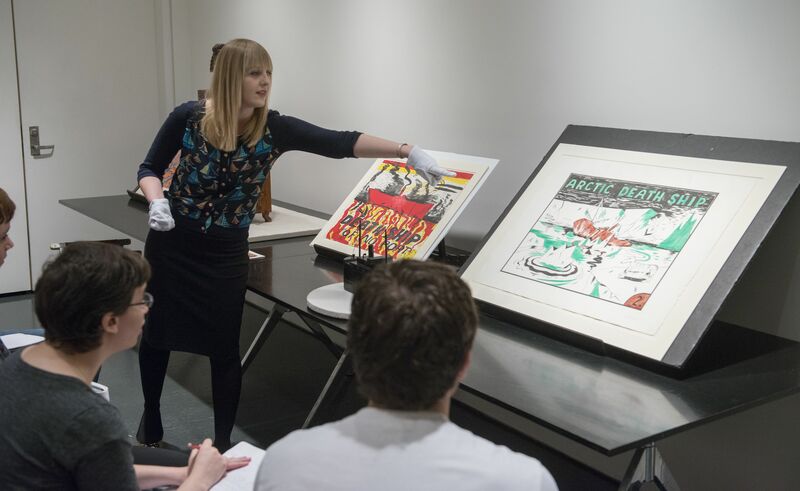 Several academic museums in the United States have a similar space for classes and researchers as part of their resources. Before my appointment student interns had monitored classes as a security measure. I was the first member of senior staff to be dedicated solely to the study room classes. My role was initially to supervise the artwork during classes, to make reservations for bookings, to prepare the artworks and move the pieces to and from storage. My background for this position was not strictly academic, although I have a Masters degree in Art Gallery and Museum Studies, but until this point my professional career had been within museum Registration Departments where documenting and cataloging artworks had been my mainstay. As the winter semester commenced I took a backseat role in the classroom. I observed and paid close attention to how many of the Professors and Teaching Assistants used the artworks and interacted with their students. This was new and fascinating to me, I had never received this type of formal Art History teaching with objects. I soon began to gain a sense of certain ways classes worked well, the most obvious factor being the layout of the artwork within the classroom. Spacing artworks around the room seemed to be the most straightforward way of creating circulation and ample viewing space around the pieces. Previously artwork had been lined up along a single ledge along one wall, in addition to this ledge I invested in tabletop easels to set up a number of artwork stations around the room. The new layout encouraged the teachers to break their students into smaller working groups. From my observations group work has been the most productive and energetic form of teaching and learning. It can encourage students to begin to look in depth at the artwork together; I believe that there are benefits of students communicating to each other rather than being told what to look at. I have noticed that some students new to Art History can be intimidated by making observations; that they may be looking at something “in the wrong way” or that they are missing language to deal with what they are seeing. Certainly teachers are able to provide insight into the vocabulary, but small group work allows for students to deal with some of these other larger insecurities together. Another key to utilizing the artwork in a productive way has been to begin with a basic visual analysis, which is often hardest for the more advanced Art History majors than students with no art background. Being able to look at artwork without glass in a small space removes mental and physical barriers. The ability to clearly see how something has been made encourages the students to look much more closely. By asking them to note how the ink lies on the paper can be a breakthrough for many students to think about surface and facture. A basic visual analysis requires the students to simply describe what they see rather than discuss what they think the subject matter is or what the work might possibly mean. This activity creates a level playing field; the knowledge required is as straightforward as using close observational skills. 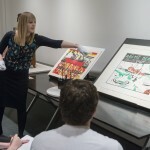 Explaining how a woodcut is created or how a lithograph is produced is a basic but critical foundation to understanding art. Using actual art objects to illustrate this turns the subject of facture into something powerful; students have remarked how difficult art is produce! This may seem obvious to those with experience and knowledge of art making, but to some students the skills required to make art can seem hidden and vague. Understanding the creation of artwork can be removed when reading about it, but when the subject is presented in the context of a particular piece of art then a veil can be lifted. Over the past four years my role within the study room has expanded to become a more active presence. Professors and teachers using the collection often appreciate my input as a museum professional; drawing on my knowledge of conservation issues, my research on provenance and other collections issues has I hope added to their experience. The benefit of being in a museum space produces the opportunity to discuss the subjects of collection practice and exhibition display. 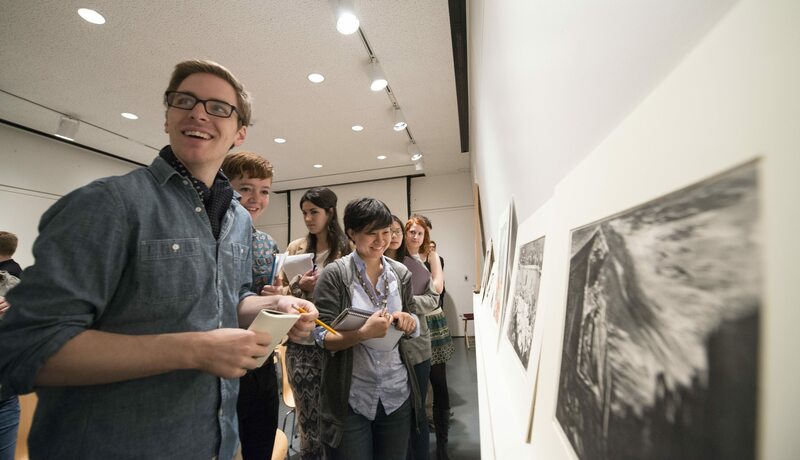 Students share their thoughts on other institutions and how this differs to the experience of being in the presence of art objects in the study room. When looking at a Roman coin in a class last term one student exclaimed “I can’t believe I am reading Latin on an actual Roman artifact- this is the best art class I’ve ever had!” Of course not every student has such a direct and enthusiastic reaction to objects, but after every class I have had at least one or two students come to thank me personally for the experience of being allowed to be so close to art objects. Study Rooms in academic museums are a tremendous resource, and I would certainly encourage Art History teachers to consider looking into such a visit as part of their syllabus. CAA Wrap Up: What Have You Done for Art History Lately? What a wonderful idea. I teach Art History and Intro to Humanities as well as Studio Art at a small community college in rural Missouri. 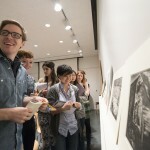 Each semester, I bring groups of students to the Saint Louis Art Museum. The first question I am always asked by the students is, “are these things real?” The idea of removing barriers and directly exposing them to the Art is amazing. I curated an exhibit of Native American ceramics for Lindenwood University in St. Charles when I was a grad student and teacher assistant there.I will never forget being in such close proximity to these delicate treasures. I am going to see if there is such a program in St. Louis, and if so I will use it. If not, I will ask for it, and if they have no one to do it I will volunteer. Thanks!